Ipe also called brazilian walnut originated mainly from brazil,it is one of the hardest tropical hardwood in the world.The wood is much prefered in western countries of Europe,USA in application for outdoor wood decking,wall paneling,wood joist etc.The wood has some surprisingly high stability & weathering resistance & hardness, that you can not find from any other tropical wood species.That's why so many leading architects or landscape designers love to use it as outdoor flooring.Ipe raw wood resources from Central & South America becoming less & less,so the cost of this material keeping on rise in the past few years. 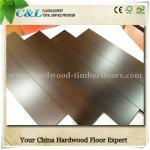 C&L hardwood supply the brazilian walnut hardwood flooring or parquet flooring from the factory in china,where we import the wood directly from South America and process the brazilian walnut wood floor board in China. C&L hardwood mill the solid Ipe wood with four side Tongue & Groove Joint,board to board fit perfectly to each other,very easy to installation.Each board is with slightly 45°Micro-beveled Edge,which makes the flooring overview natural & elegant. Mositure Content: Interior use Ipe before shipping will be dired in our factory special equipment,the MC will be controlled under a humidity below 12%.Exterior use Ipe with MC 15%-20% to suite outdoor weather conditions. Solid indoor use ipe flooring from C&L hardwood is sealed by primer pu finish on six sides on floor board , it enhances the dampness resistance to garantee the board stability after long time use. Solid ipe floor surface coating is applied by 8 layers primer finish,4 layers top finish.The top finish we use germany treffert aluminum oxide UV coating which greatly enhanced the scratch resistance of the timber flooring. C&L hardwood solid Ipe flooring is garanteed with life time structure warranty,while the enhanced UV coating will garantee a 7 years wear through resistance.Old brazilian walnut solid wood flooring can be sanded more than 5 times ,so it's fully recyclable.